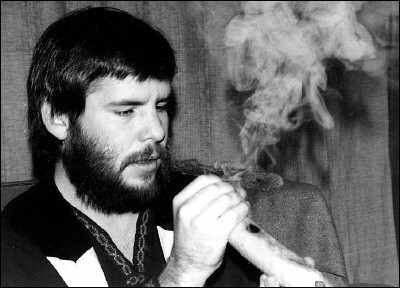 This is me doing a pipe ceremony just prior to a storytelling performance in 1983. This is a smoke-blowing pipe. The cloud of smoke represents the Old Time stories gathered in one place, offered as food to various native spirits. If the cloud dissipates quickly, that is a sign that the spirits have showed up, been fed and accepted the offering. This ensures a good storytelling. I carved the pipe out of madrone, and then Grandpa Roscoe and I drilled the holes in the workshop behind his home on Howard Avenue in Medford, Oregon. At that time, he gave me his old tobacco pouch and that's the pouch I still carry with me.